Timothy and Vivian have a huge year ahead of them. Given that I’m posting engagement photos, I’m sure the first part is obvious; These two are getting married. These two have also been working hard on the final stages of opening their own Brew Pub for the summer. If you haven’t heard of it already, you need to start getting excited about this place; One Great City Brewing Co.
First and foremost, I must say how excited I am to have a place like this in Winnipeg. Being able to stop by, have a beer and try some tasty food where everything is produced in house is awesome. What I’m actually even more excited about however, is the fact that these two are hosting their wedding in the brew pub later on this summer, and I get to photography it; An experience I’m sure I wont soon forget. 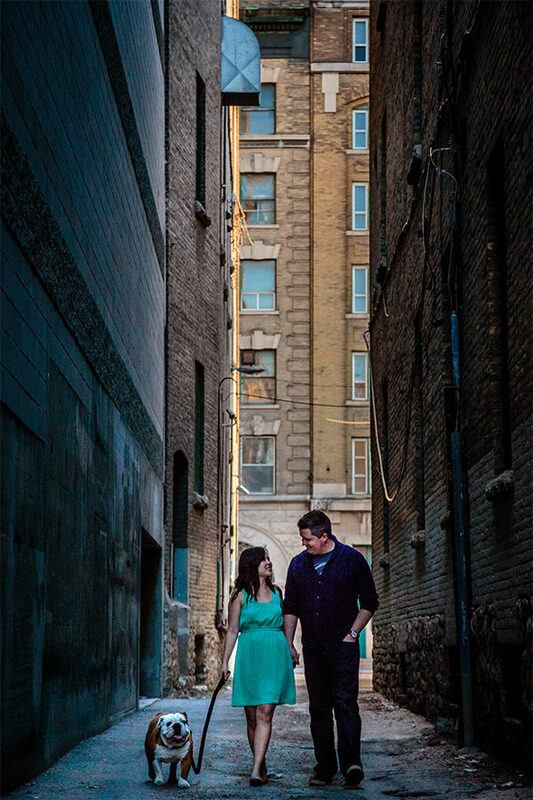 Their love for this city and community was evident when we walked around The Exchange District together snapping some engagement photos alongside their dog, Gladstone. And in case I haven’t said it enough this year, I LOVE exploring this city with other people who love it as much as I do.